Everything you need to know about time management is captured in three words. Eliminate – stop unnecessary or low priority tasks. Prioritize. Delegate – put stuff on someone else’s plate. Accelerate – improve efficiency. Use brevity. Trivialities dominate those without priorities. The worst place to schedule an appointment is in an open block of time. Look at next week’s calendar. Do you see an open morning or afternoon? Protect it! When someone calls for an appointment, allow time between meetings, but schedule them on days where you have more appointments. Don’t think, I’m already busy on Tuesday and open on Wednesday so I’ll schedule them on Wednesday. What a waste. Connecting with leaders in other divisions. Talk this strategy over with teammates and bosses. Determine what fits organizational culture and enhances organizational objectives. Could you create a weekly “no appointment time” for your entire organization or department? Between 8:00 and 9:00 or 9:30 a.m. on Thursdays, for example. Shorten some meetings to forty-five or thirty minute increments, or even less. Brief isn’t always better. Value connection-time. Take ten minutes at the beginning of some meetings to reconnect on a personal level. Where did you grow up? Where is anyone volunteering in the community? Enhance time management by eliminating waste. 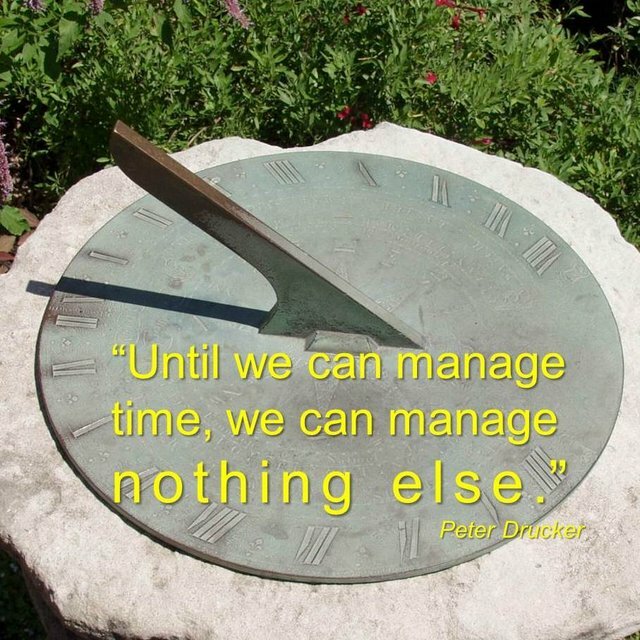 What time management tips help you use time wisely? This will definitely change how I think about my more open days. And I always need a reminder to not focus on the more trivial things. It’s so easy to fall in that trap though when you know the more trivial things are easier to get done and has less fear attached to them. I find it’s easier to tackle the bigger, scary things by just committing to tackling them for small manageable chunks of time. Like a 25 minute burst followed by at least a 5 minute break where I walk around and avoid technology for a short period (AKA Pomodoro technique: http://en.wikipedia.org/wiki/Pomodoro_Technique). This post has influenced how I perceive my time also. I must add that it can become challenging when your business is global and not only do time zones pose a scheduling concern, but cultural norms can consume time quickly…such as needing to develop personal rapport prior to getting down to business (I find this is important in japan, for example). I never thought to block time for my research or looking at organization function for improvement. This strategy defensively empower me to think more critically of my activities during the day and weeks comes ahead. “To do two things at once is to do neither” Publius Syrus, Latin writer of maxims, 1st century BC – focus on one thing & get it done – saves lots of time in the long run! My secretary and I have constant conversations about protecting my time so I can be efficient. It is a struggle when one of my staff says, “Do you have a minute?” because it never is! We are working on reducing drop ins and having folks schedule appointments so that I am able to dig in to pertinent tasks and get the work done in the office in order to get out in to classrooms. Love the idea of taking a walk every 25 minutes in order to take a tech break…very valuable! In fact, you could even reverse the drop in and use the 5 min break to see how someone on your team is doing (or a peer). It’s usually a good idea to frame it as “I’m just out taking a short break and wanted to check in for a couple mins and see how you are”. The 2nd half is obviously pretty changeable, but be sure to mention it’s a short break you’re on, that way they keep it short or don’t feel slighted if you have to bolt after a few minutes. I’ve practiced the “take a quick walk” idea on a number of different occasions. I look doing it with a count down clock on my desktop. Seeing the clock count down creates a sense of urgency. Dan, thanks for your wisdom here. Man, “trivialities dominant those without priorities” is fire. This is not just true for the leader, but it is true for any organization that cares about mission and vision. Now, I asking myself, where, in my life and ministry, am I not living according to priorities. Good stuff. Dan, when I began my commercial kitchen design consulting business 50 years ago, I discovered that I did not know where my time was going. Like many professionals it was essential that I knew where my time was spent. I was selling my time. I began tracking my time every working day in 5 minute increments, continually throughout the day. After I fired myself and went to work for Truett Cathy at Chick-fil-A, I rediscovered the need to track my time. For over 30 years, until I retired, I tracked my time every business day in 5 minute increments. I recorded productive time and wasted time by category and summarized and reviewed it to determine how to spend my time more productively. What matters is not how you plan your time, it’s how you use your time! Thanks Jimmy. Anyone serious about managing time has to do some sort of tracking in the process. How am I using time? Where am I wasting time? What are my most productive hours? Your example is powerful. I’m thankful you stopped in. Planning and managing how to use your time golden! Prioritizing works wonders, as well as delegating, key is for us to learn to delegate and when not to delegate. I’m an early morning person. I guard that time for writing AND it is easier to write at 4am because there are fewer interruptions. Immediately following my writing time, I tackle my most dreaded task of the day FIRST. When I don’t do this it too frequently gets put off and grows into even greater dread. I love your advice: schedule a series of appts. on the same day which leaves you blocks of uninterrupted time for important things. I’m putting this into action right now. Thanks! The day is so full that we often don’t really have time to ‘stop and think’ – – and it’s important to be able to be alone with your thoughts. . . my calendar has ‘Policy and Procedure Writing’ from 3-5 every afternoon. . .make up your own name for it, but commit to the space. . . you may not get to use all of it, but having it there helps. Elimination of the unnecessary is so important. It is important to think before we say yes to anything as we are saying no to something else. That can be difficult for the “people-pleasers” among us. Great stuff Dan! Thanks Tom. Glad you injected the people pleaser problem. So many of us are over-committed because we are people pleasers. Pow! I have never liked to think of delegating as “putting something on someone else’s plate. When it is put that way, I think of it as dumping or I am not fulfilling my responsibility. I think of delegating as a growth opportunity for someone and who is this project or task the best fit for. Some may say it is just semantics, I choose to think of it as a way of thinking or a culture that you try to create. Thanks Patrick. Good call. I see what you mean. Dan, can you elaborate on what you mean by “personal development” in this context? I have seen this term have different meanings: working on a creative pursuit (e.g. work on creative writing), learning a foreign language and so on. I tend to take the opposite approach when it comes to scheduling appointments. I like having some open time but not too much. I’d rather schedule appointments every afternoon and keep my mornings free to do productive work. The only time I don’t follow this structure is if the meetings are outside of my office/home. Then I prefer to take the time I’ve already driven away from my location to do as much away as possible. This saves the frequent drive time I would otherwise spend going back and forth. I also never understood why a meeting is more worth than actual time for you to work on your stuff. At Sheldonize (https://sheldonize.com) we for example make a point of automatically scheduling tasks on your schedule, such that you get less tempted to put meetings in places where you should be working!